The Auglaize Hydroelectric Plant is located on the Auglaize River southwest of Defiance, Ohio. The facility, constructed in 1912, was purchased by Bryan Municipal Utilities (BMU) in 1996 as a long-term, zero-emissions power supply resource. In 2017, the Auglaize Hydroelectric Plant achieved its second highest yearly energy production, generating enough electricity to supply the annual power needs of 1,268 Bryan residences. Renewable energy resources that meet PUCO criteria are eligible to receive renewable energy certificates/credits (RECs) for each megawatt-hour (MWh) of energy they generate. RECs are purchased by investor-owned utilities and others interested in promoting development and use of renewable energy resources. In 2009, BMU submitted a PUCO application to certify the six Auglaize Hydroelectric Plant generating units as Ohio Renewable Energy Resource Generating Facilities. However, Ohio’s renewable energy portfolio standard made green energy resources constructed prior to 1998 ineligible to receive RECs. 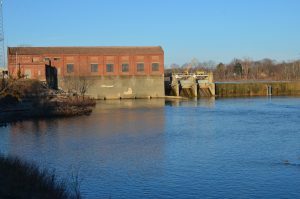 The PUCO approved certification of two Auglaize Hydroelectric Plant units in 2009, but declared the remaining four units ineligible because they were installed prior to 1998. This provision effectively penalized Bryan for its early leadership in development of renewable energy resources. In 2017, BMU worked with American Municipal Power/Ohio Municipal Electric Association representatives to secure inclusion of the so-called “small hydro provision” of Ohio Amended Substitute House Bill 49. The small hydro provision amended the state’s renewable energy portfolio standard to include Ohio hydroelectric facilities with generating capacities of six megawatts or less, regardless of the facility’s commercial operation date. On April 16, 2018, the PUCO approved BMU’s application to certify all six Auglaize Hydroelectric Plant generating units as Ohio Renewable Energy Resource Generating Facilities. The Auglaize Hydroelectric Plant also helps reduce local power supply costs through sale of energy produced at the facility and by transmission and capacity credits received for generating during peak demand periods. In 2017, these credits totaled $655,588.